Even though I grew up in the rolling piedmont of Carroll County, Maryland, some of my best memories are of crabbing trips on Bay tributaries, accompanied by my grandpa, dad, brother, and various other family and friends. Recreational crabbing is perhaps one of the most iconic Maryland experiences you can enjoy, and I would argue that the Wye River is one of the best places to do it. Perhaps to the dismay of my crabbing crewmates – who were working hard to fill their bushel basket – as a young naturalist I would pay little attention to the harvest, focusing almost entirely on the wildlife. Leaving out of the boat ramp at Wye Landing, we would hug the shores of the Wye Island Natural Resource Management Area to set our collapsible traps. These sandy, yet mostly tree-lined banks, largely devoid of waterfront homes and docks, still resemble the Chesapeake of the distant past. While much of the interior of the island is the stereotypical agricultural landscape of Maryland’s Eastern Shore, the thin strips of forest, eroding cliffs, marsh and brackish tidal waters host an important diversity of life. It was in these places that I saw many unique local species of wildlife for the first time. Incredibly, they can still be found there in healthy numbers. A few decades after I first fell in love with this serene place that my grandpa calls “Heaven on Earth,” I now watch the July sun ignite over the tree line above the glasslike waters of the Wye River. After months of anticipation, we embark on what has now become an annual family crabbing trip. I look back across the boat’s wake and wonder how many of those distant white oak trees could be related to the centuries-old Wye Oak, our once-mighty state tree that finally succumbed to old age and the elements in 2002. Every year we stop by the nearby Wye Oak State Park to see the remnants of the original tree and pay our respects to the new state tree now growing in the footprint of the once majestic giant. With my grandfather now in his late eighties, we have begun running the more efficient trotlines on a rented commercial boat charter instead of loading traps into a small wooden boat with an outboard motor. My family loves crabbing, but the reason we are out here today is to spend time with each other and take our grandfather back to his favorite place that he introduced us to so many years ago. I enjoy crabbing, but my mind is usually elsewhere. Back home I spend most of my time outdoors either hiking or paddling, camera in hand, ready to capture the wonders of wildlife and nature. Wye Island offers great opportunities for both of these things, even if it means peering into its wild spaces from the deck of a crabbing boat. This trip provides some spectacular views of many iconic Chesapeake Bay species I have come to expect and enjoy. As my eyes follow the glowing shorelines I spot my first great blue heron hunting for fish. Next to it is a double-crested cormorant whose wings are spread out to catch the first rays of sunlight, as the sounds of Canada geese echo from a nearby cove. As we pull up to our second trotline, I notice a splash on the other side of the boat. Spotting what most would assume to be a shark fin, I watch as a pair of cownose rays cruise along the surface. Then, with a half dozen blue crabs already battling in the bottom of the bushel basket, I hear the call of an old friend flying above. A female osprey soars overhead with a fish in its talons and lands on one of the nest platforms erected in the water – to the great joy of her two hungry young. We make a few more passes and luckily are still netting a decent number of crabs when I am able to point out a really special species that not too long ago was on the brink of extinction – the Delmarva fox squirrel. This large, silvery squirrel was listed as endangered until recently. Through focused conservation efforts, it has returned to many Delmarva locations, including here at Wye Island. A trip along the Chesapeake would not be complete without a sighting of another Endangered Species Act success story, the bald eagle. Today does not disappoint, as we see three, soaring above and perched high up in the tree canopy overlooking the river. The final species that I always aim to see is one of my favorites – the Maryland state reptile. The diamondback terrapin has a complicated history in the Chesapeake, often unsustainably harvested until finally receiving the necessary protections that would allow it to bounce back. Now, in places like the Wye River, diamondbacks can still be found in healthy numbers. I am ecstatic to not only see their iconic white heads peeking above the surface of the water, but I even observe one basking on a fallen tree along the shore. After a long day on the water and a full bushel basket of crabs, I look back at the island as we speed back towards the landing. In this chaotic world, Wye Island has come to symbolize peace and tranquility for me and my family. It is a refuge for wildlife, including some that owe part of their comeback to its protected shores. It is a time capsule for a simpler time and a microcosm for many special places around the great Chesapeake Bay. I hope that you may get to know and love this place as I have. 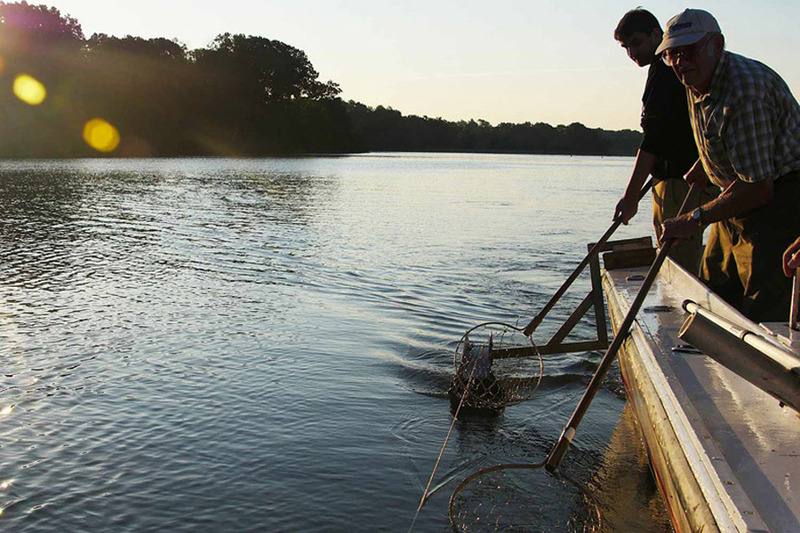 You can create your own traditions at Wye Island and experience this unique place yourself! In 2018 Chesapeake Conservancy, in partnership with REI Co-op and Maryland State Highway Administration, opened a new canoe and kayak launch. Learn more about the Wye Island Paddlers access site. 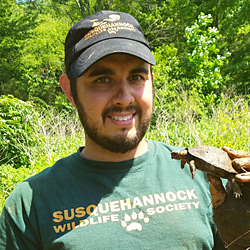 Scott McDaniel lives in Harford County, is a Maryland Master Naturalist, Eagle Scout, holds a Bachelor’s of Science degree in Electronic Media & Film, and is the executive director for the Susquehannock Wildlife Society.